with trusted counselors there to help you break through emotions related to Eating Disorder Issues. I invite you to my special 2 ½ Day Workshop that will help you to heal the underlying issues that cause you to eat so you heal your relationship with food once and for all! If you’re anything like me, you want to live your life without thinking about food all the time. You want to stop thinking about how you look and stop judging yourself for everything you do, eat and say. You want to enjoy your life fully and be happy. But there are obstacles between you and your dream to live that happy life – and that’s those constant thoughts about what you’re eating, what you just ate and what you’re going to eat later, how you look and who’s going to judge you for it. Have you tried diet after diet, promising yourself never to binge again, exercising to try to be thin and happy– but none of these seem to work very well, especially in the long run? Fifteen years ago, there I was, struggling to like my body, to like myself, and to be happy. I wanted a better life. I wanted to feel good! Unfortunately, no matter what I did, it never worked. It just made me feel worse and think about food more. I compared myself to every woman I saw. I hated my body and hated myself for eating chocolate and other “bad” foods. I dieted on and off. I exercised on and off, never sticking with it and always ending up feeling bad about myself again. You can probably relate – you yearn to feel good about yourself but nothing you do works. So you’re frustrated or worried about never getting better. I’ve been there too. It wasn’t fun going through my days thinking about everything I ate and worrying about who would love me if I looked like this or how I would lose the extra pounds or how I would stop eating so much chocolate. What was most frustrating – I knew it was taking away from my life and my relationships and my happiness but I didn’t know how to stop thinking about it all the time. I knew I wanted a better life but I didn’t know how to get there. (I now know how to stop the cycle, and I want to support you too). In my heart of hearts, I wanted to work with others with food and body image issues and I knew I had to start with myself first. So I made a deep commitment to doing whatever it takes to heal my relationship with food so I could stop my obsession with food and help others to do the same. Today, I’m grateful that I can eat what I truly want without any guilt. I feel good in my body and appreciate all the various shapes and sizes of all women. I exercise regularly and enjoy it. Even more wonderfully, I have the honor of helping more and more women heal their relationship with food and their body and help them to live a happy, fulfilling life. I am passionate about helping women feel better about themselves! I am passionate about helping women have all their feelings which will cause greater joy and happiness. It has always been my dream and I love it. I want to help you too! Remember, the more you move away from thinking about food and your body, the more you can live your life, the life you truly want to live! How did I go from thinking about food all the time to eating what I want without guilt? I worked step by step on behavioral changes that helped me change my relationship with food and helped me get to the real issues. I learned to have my emotions, to form healthy relationships and to let go of what was really bothering me. I learned more about myself and what it’s like to have a healthy relationship with food. I learned to support my clients into healing the underlying issues so they don’t need to use food to cope. Then I synthesized the best-of-the-best into my own system for ending the obsession with food, once and for all. This workshop comes from years of my own healing and from working with my group and individual clients for the last 12 years. And now I’ve taken every essential element that’s worked for me and many clients and put it into a workshop I’m bringing to you. Once you really go into and heal the underlying issues, you will go a long way toward ending your obsession with food. It helps you grow and heal so you can make the changes you want in your life. This is possible for YOU too. It really is possible once you learn how to have your feelings in a productive way – you will heal your relationship with food- I’ll show you below, right on this page. What would it mean to YOU to eat what you want without guilt or worry and to live an authentic, happy life? I mean REALLY eat all the delicious food your body wants and spend the rest of your time living your life, for the rest of your life. So you NEVER have to obsess about food or how you look, worry about what you are eating or about gaining weight, comparing yourself to other women, always coming up short, or avoiding exercise or only exercising because you “should.” Could it mean…. Enjoying your life and feeling good about yourself? What I’m providing here is so much more than a workshop for ending your obsession with food. It’s about healing so you can have the happy life that you really want. It’s about learning to give to yourself and learning to love yourself. It’s about letting go of being in control so you can relax and go with the flow of life. Once you’ve “cracked the code” of how to have a healthy relationship with food, everything will feel more possible. Whether you’re a newbie or have been working on this issue for some time, you’ll discover how to truly heal your relationship with food from the inside out. This will help you maximize your healing and progress. #1: What is Really Going on Underneath Your Struggles with Food and Weight. The FIRST thing we’re going to do together is to help you understand the cycle you are in and the affect it has on how you feel about yourself. Why are we starting with education and furthering your understanding? When you understand what is going on inside, you will feel greater empathy for yourself. This will also help you prepare to go deeper so you can heal the painful cycle of beating yourself up with food and your weight (and in all areas). The different components of disordered eating behaviors – deprivation sensitive eating and addictive eating. What your critical voice is trying to do to help you and what the part of you that wants to binge really wants. What happens when you name food as “good” or “bad” and how this leads you to feel bad about yourself. Discover the underlying issues that drive you to eat so you can give yourself what you really need and want. How to feel freedom from food so you can choose broccoli and really enjoy it or ice cream and not eat it all in one sitting. #2: Deepen Your Relationship with Yourself and Others so You Can Stop Using Food to Cope with Life. Now that you have a greater understanding of what is going on underneath your obsession with food and your weight, the next step is to get the support you need to heal! 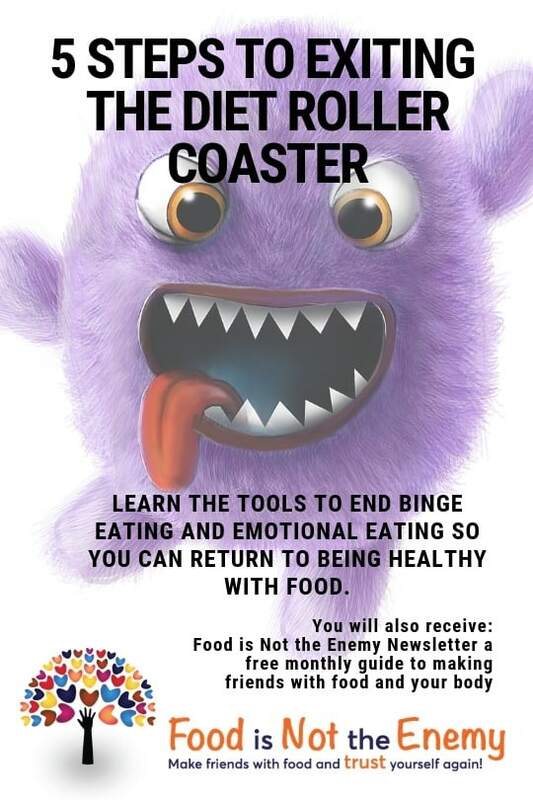 After you’ve found out (in the education portion of the workshop) that you can change your relationship with food, you will be ready to move forward, learn more about yourself and learn to use your relationship with food to discover what is really bothering you. Once you do that, you can heal and let go. Really enjoy food when you eat and enjoy life when you aren’t eating. Heal the underlying causes of your unhealthy behaviors with food. Address your emotions so you don’t need food to help you cope. Create a community of support to help you heal. Take further steps toward a long lasting, healthy relationship with food. Unfortunately, so many women hate their body, judging it and comparing it to other women. It takes away so much of your time and energy and just leaves you feeling bad about yourself. In this workshop, I’m going to help you work directly on your body image. I’m going to support you in addressing your own unique feelings toward your body so you can shed the negativity and feel good about your body. You’ll receive exercises to help you confront your body so you can stop avoiding it and/or focusing on what you don’t like. You will learn how to put your attention in a place that leaves you feeling positive and good about how you look. You’ll learn what behaviors help you and what behaviors hinder you from liking your body so you can empower yourself to stand up to cultural norms that don’t feel good to you. When you begin to address the underlying issues, you’ll be well on your way to feeling normal around food and enjoying your life! Have you ever gone on a diet, only to gain the weight back again? Have you ever tried to restrict food but only felt more out of control? In this workshop, we’re going to work with you on a deeper level so you can create and maintain the kind of relationship with food that you want. You’ll discover how to clearly separate food from your emotions. I’ll teach you the effective ways to use food only as fuel, and how to deal with your emotions in a healthy way. You’ll experience how to deal with your feelings head on and let go of the power they seem to have over you. So what is the Bloom Body Image Workshop? It’s an in-depth, small-group, safe-space, where I work with you to create a complete, permanent plan for creating a healthy relationship with food. You’ll receive the growth and support you need to end bingeing and other behaviors that leave you feeling out of control. These are processes I’ve been utilizing to support my clients to help them become normal eaters and to be happier, healthier individuals. It’s thinking that they have to figure out everything on their own. How many times have you tried to do this on your own only to feel more like a failure and more lost and ashamed? There are others that feel just like you do. Really getting this is often the first sigh of relief clients get. In this workshop, you’ll be part of a select group of people working on healing their relationship with food, so you’ll have the motivation of working with, being supported by and being accountable to others. Plus you’ll be able to learn from others. Last but not least, it will be a lot more fun! Picture yourself getting excited, getting support and understanding from a fellow Bloom Body Image Workshop participant when you make a change or leap in your healing! It’s an exhilarating feeling. Especially if you’ve been longing for this change for a long time. You’ll enjoy this feeling even more when you celebrate it with our group. It’s more rewarding working with a support team than by yourself – and you’ll have a whole group of others to learn from and to motivate you. Great news! I can’t wait to work with you. You’ll get a lot of direct training and support from me. And you’ll get the healing that has helped me and many others. Plus you’ll have a ton of support in this workshop, both from me and my co-leader Erin and from your peers who are also participating full force. It’s a lot more powerful to grow with the support from others. Food issues will be a thing of the past when you have TRULY healed your relationship with food and your body… an ability to focus on what is truly important in your life… an ability to enjoy life now rather than when you lose weight… an ability to finally enjoy the foods you love without guilt or fear of gaining weight. Imagine what that would mean to you… and your life… when you …. Only you can make the choice, whether you’re perfectly happy with how things are going for you now, or whether you’re ready for a shift. When you combine the feeling of a safe space, and a group to support you, you experience a whole new meaning of the word healing. But more than that… when you combine the feeling of using food for fuel with living your life as you want to be, you have an incredible sense of fulfillment. And that’s what it’s all about, isn’t it? It’s about more than food… it’s about the quality of life that you have always wanted. It is something you have always wanted and I want it for you too! I sincerely hope you get started right away. This world needs you and all that you have to offer it. Please Contact Anne Cuthbert for pricing & more information. Are you tired of doing it alone? I look forward to getting to know you better and to working together. PS Still have questions? Email me using my secure contact form on my Contact Page and I’ll get back to you as soon as I can. PPS Close your eyes for a minute and imagine yourself six months from now. Are you still exactly where you are now or are you engaging in life and feeling good about your body and food? The choice is yours. Six months from now, you’ll wish you’d started this today. This price offer is only available for a limited time and for a limited number of participants, so be sure to secure your spot today. You can feel great in your body!